The Arts and Science Federation of Associations elections have come to a close and its executive team has been restructured. Instead of having presidents and vice-presidents, ASFA has shifted into a non-hierarchical structure with coordinators at the helm. Four hundred and ninety-three arts and science students voted in this years election. Quorum was 370 votes, 2.5 per cent of the 20,000 students that ASFA represents. All referendum questions passed except the $0.18 per credit fee levy increase the federation was asking for. 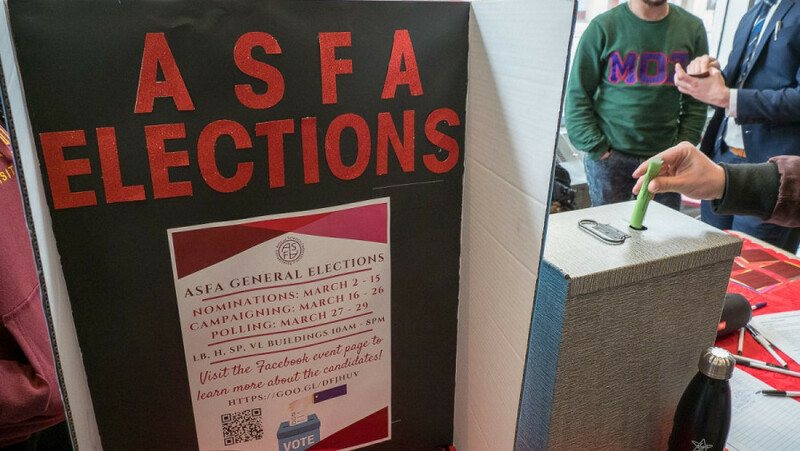 ASFA’s fee levy has not been increased since 2008, though they have tried persistently to increase their collection for years. This is the seventh time an increase has been asked for and denied over the last three years, either due to elections not meeting quorum or students voting it down. The Concordia University Creative Centre for Reuse will begin receiving a $0.04 per credit fee levy from ASFA students starting next fall. Do you as a member of the ASFA, agree to increase the fee levy by $0.18/credit, from $1.22/credit to $1.40/credit, to be adjusted annually in accordance with the Quebec Consumer Price Index, effective the semester of Fall 2018? Do you agree with the adoption of the following By-Laws? Do you as a member of the ASFA, agree to levying a fee of $0.04/credit for the Concordia University’s Center for Creative Reuse (CUCCR) for the purpose of enabling the future expansion of this project, effective the semester of Fall 2018? With respect to the foregoing(s), ASFA shall take no action that opposes Indigenous sovereignty in accordance with Indigenous Directions Leadership Group or any such position decided by Council.